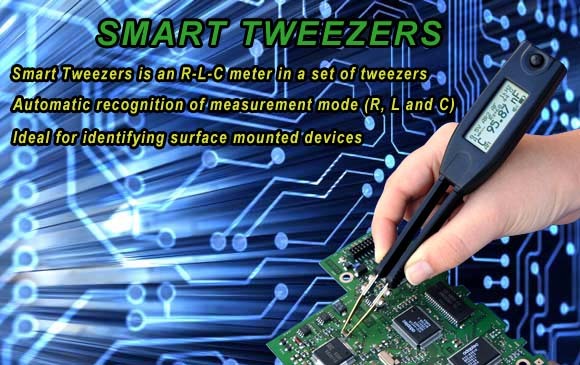 Smart Tweezers is an R-L-C meter in a set of tweezers. Smart Tweezers features a unique patented mechanical and electronic design that incorporates a built-in direct precision SMD probe designed for component evaluation on the production line, component impedance testing and sorting of SMD components. 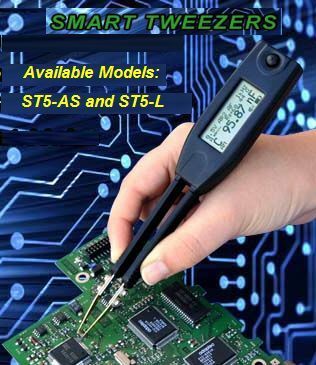 Smart Tweezers dramatically cuts the time necessary to troubleshoot and debug a complex PCB making process of locating of a faulty component a breeze. The integrated SMD probe and graphic display, combined with automatic recognition of measurement modes (R, C, and L) and the range of measurement, allow the operator to focus on the component under test. As a result, testing, sorting and evaluation of components become more efficient and cost effective. ST5-S SMT SmartTweezers/Professional Highest Precision LCR Meter with accuracies from 0.2% to 0.5% (includes a carrying case). Replaces larger ST5-AS which will not be produced and supported any longer.